CINCINNATI--(BUSINESS WIRE)-- The Board of Directors of The Procter & Gamble Company (NYSE:PG) declared an increased quarterly dividend of $0.7459 per share on the Common Stock and on the Series A and Series B ESOP Convertible Class A Preferred Stock of the Company, payable on or after May 15, 2019, to Common Stock shareholders of record at the close of business on April 19, 2019, and to Series A and Series B ESOP Convertible Class A Preferred Stock shareholders of record at the start of business on April 19, 2019. This represents a 4% increase compared to the prior quarterly dividend. 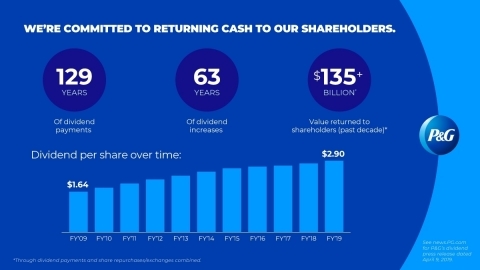 This dividend increase will mark the 63rd consecutive year that P&G has increased its dividend and the 129th consecutive year that P&G has paid a dividend since its incorporation in 1890, demonstrating the Company’s commitment to – and extending its long-term track record of – returning cash to shareholders.